Getting hitched would change things for Ernie, who has long sang about how his bath toy, Rubber Duckie, "was the one." A debate over the sexuality of Sesame Street's most famous duo has dogged the show since Bert and Ernie first appeared in 1969. The puppet pair sleep next to each other and bicker almost as much as a married couple. But the producers of Sesame Street say Bert and Ernie's relationship is purely platonic. 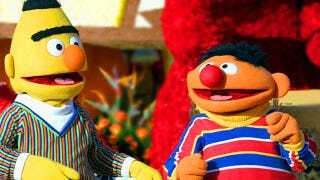 "Bert and Ernie are best friends," the non-profit Sesame Workshop said in a statement. "They were created to teach preschoolers that people can be good friends with those who are very different from themselves. "Even though the Sesame Street Muppets ... possess many human traits and characteristics, they have no sexual orientation." Right, because these two puppets aren't actually people, remember? Moreover, is it even worth showing a gay marriage to kids if it's not even real? Maybe we should try to concentrate our efforts on allowing gays to legally wed throughout our entire country.